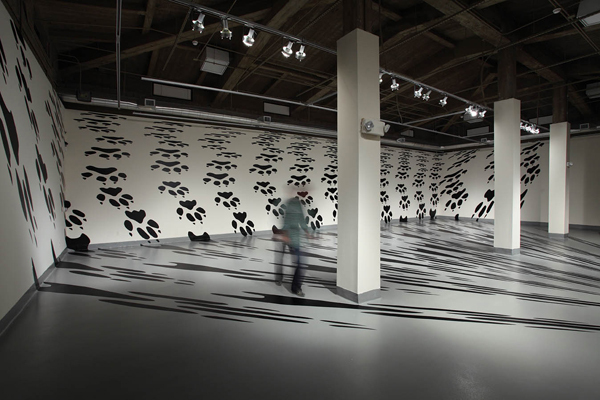 "Regina Silveira: Limits" at the Stanlee and Gerald Rubin Center for the Visual Arts, October 6-December 10, 2011. "Gone Wild Reversed," 2011, digital image, adhesive vinyl cutout, 12’H x 57’W x 33’D. Opened in 2004, the Stanlee and Gerald Rubin Center for the Visual Arts at The University of Texas at El Paso presents exhibitions of contemporary art that encourage adventuresome thinking and dialogue. Under the direction of Kate Bonasinga, the center offers the geographically isolated region of El Paso a direct experience with contemporary art of international recognition and importance. The center serves as a learning site for students from the University of Texas at El Paso (UTEP) and the surrounding community by creating opportunities for student involvement in the planning and execution of exhibitions, by engaging in interdisciplinary education about the exhibitions on display, and by providing a framework for critical thinking about contemporary art and its place in our world. Tue, Wed, Fri,10 am – 5 pm. Thurs 10 am – 7 pm. Sat 12 noon – 5 pm. To serve the University and broader El Paso community through exhibitions of challenging and innovative visual art. The center is a University Art Museum, so it’s partially state funded, partially funded through government grants (federal and state), and through private foundation grants and gifts from individuals. Approximately 10 exhibits for 3 months each (three galleries in the museum). Contemporary visual art exhibitions, performances, and lectures. Through the director and a committee. 3) art that responds to our geographic and political location at the epicenter of the Americas. Working: Risky exhibitions that challenge our audience. Not working: Safe shows that don’t. A big one. There is no other place like this for hundreds of miles. Continuing to grow and serve our audience. Traveling more exhibitions and making a bigger impact nationally. Images courtesy of The Stanlee and Gerald Rubin Center for the Visual Arts at The University of Texas at El Paso.